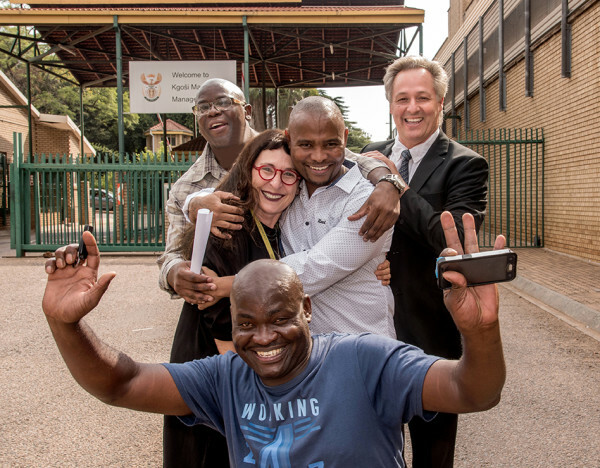 Two men were released from prison after spending 14 years behind bars thanks to the help of the Wits Justice Project. SAMUEL “Sampie” Khanye (37)and Victor Moyo (35) walked out of prison on 24 March, 2017 as free men after spending 14 years behind bars for a crime they did not commit. With the help of the Wits Justice Project (WJP), human rights advocate Egon Oswald, coaccused Thembekile Molaudzi and advocate Carol Steinberg, the two men were able to gain their freedom. They were arrested, along with six others including Molaudzi, for the murder of Mothutlung policemen, Dingaan Makuna, in the North West, during a botched robbery in 2003. They were finally convicted by North West Judge President Monica Leeuw in 2004for the murder and have claimed their innocence ever since. Molaudzi, who played a huge role in helping the men obtain their freedom, spent 11 years in prison before having his sentence overturned in June 2015. Since then he has made a point to help both men regain their freedom. “We were like brothers in prison, everything he was doing he did out of love,” said Moyo. The process was long and hardas both men had to deal with legal aid lawyers, private attorneys, the police as well as an advocate appointed by the Johannesburg Bar Council with no success. Obtaining trial transcripts to help with their appeal was a huge challenge as both men had to raise the funds to get these regardless of the fact that it should be a state expense. Getting the full transcript was also a challenge as the transcripts came up short on more than one occasion. It was not until Molaudzi contacted the WJP in January2017 to assist with helping both men get their full transcript retranscribed by Leeuw, that they could see the light at the end of the tunnel. “It took two months trying to get those transcripts,” said Carolyn Raphaely, senior journalist at WJP. Raphaely’s persistence was instrumental in Molaudzi’s release. Once the transcripts were obtained and the heads of argument put forward by Steinberg, the State concluded that the men were wrongfully convicted and ordered their immediate release. The freedom of both men came as exciting news yet they could not forget their past experience. “It was bad because I asked myself questions that I did not have answers to,” said Moyo. He constantly questioned why he ended up in prison for more than 10years for something he did not do. Khanye described the experience as “painful” as he was constantly scared of being locked up in a place where other inmates would treat him badly. However, both men were overjoyed the moment they saw Raphaely outside the gates of Kgosi Mampuru prison in Pretoria. “Seeing them walk out of those gates was one of the best moments for me,” recalls Raphaely. She also noted that Molaudzi was the real driving force behind the men’s freedom and her motivation to help them till the end. The Wits Justice Project is part of the Department of Journalism at Wits with its core values in dealing with the miscarriages of the criminal justice system.